2011 is going to be an amazing year for weddings in the Rocky Mountains! Naturally Chic is so excited for the amazing weddings we have coming up this year in Banff, Canmore, Lake Louise and Jasper! We’re really looking forward to working with such great 2011 couples and are excited to share our predications for 2011 Wedding Trends and wedding trends in the Rocky Mountains! While we’re not necessarily big on planning your wedding based on arbitrary trends, we’re definitely seeing patterns with our brides that we’re loving. 1. Personalization – Couples are continuing to put their signature touch on their weddings in creative ways. Rules, what rules? Couples aren’t following the usual patterns for ceremony or reception. Couples are now infusing more of their personalities, interests, and passions into their weddings. From creative ceremony set ups to choosing music that is meaningful to the couple for the recessional. Identical table set ups at receptions are becoming less common, with couples opting for tables of different sizes and shapes. Centerpieces are no longer “matchy, matchy”, with perhaps a uniform color, but not necessarily the same arrangement at each table. Couples are choosing wedding styles or “themes” that match their personality; sports themes (skiing, hockey etc. ), love of travel, reading or favorite foods. If the couple is ice-cream or coffee lovers, we’ll see that reflected in the wedding favors they choose (Starbucks gift cards for example), to having an ice-cream bar instead of a wedding cake. Look for many more creative weddings in 2011! 2. Eco-Chic – Green weddings and eco-friendly weddings are becoming more and more commonplace. Couples are considering the ecological impact their wedding will have on the environment and are taking steps to lessen their carbon footprint. Couples are leading environmentally sensitive lives and are not wanting their wedding to be any different. While incorporating green into their weddings, couples are still wanting to be chic, elegant and unique too! Couples are choosing venues that use food from local producers and venues that have green practices. We’ll see simple and organic centerpieces and decor, eco-friendly invitations, LED lights, organic foods, and “useful”, reusable favors and gifts. A touch of glam balanced with rustic elements will also prevail in 2011. Whether vintage or modern inspired, green weddings are always chic! 3. Natural Settings for Outdoor Weddings and Ceremonies – Casual and natural ceremonies prevail in 2011. More couples are opting for outdoor ceremonies whether at a park, near a lake or mountain, on an acreage or in a barn, or even in the backyard. We’ll see more casual, tented weddings and we’ll even be seeing more adventurous wedding settings on ski hills, hiking trails, camping areas and mountain peaks only accessible by helicopter. Couples are getting outdoors and adventurous in their nuptials! 4. Vintage – Although there’ll be no shortage in fresh, modern inspired weddings, we’ll continue to see the revival of vintage inspired weddings. Vintage and eco-chic pair together beautifully and couples will incorporate vintage family heirlooms, jewelry, and other pieces into their weddings. We’ll see retro styled decor, centerpieces and dessert bars. Think pearls, lace and vintage jewelry, vintage silverware, vintage handkerchiefs, and decor with a touch of rustic mixed in! Also look for romantic vintage gowns and pre-owned wedding dresses and retro-inspired hairstyles. We’ll even notice a vintage edge in some wedding photography! 5. Natural Elements – With the eco-weddings going strong, we’ll see more use of natural elements in everything from centerpieces and decor, to use of more natural, and organic elements in wedding bouquets. Think over-sized, organic and bulky, such as ornamental cabbage, pea pods, evergreens, twigs and pine cones. Even cakes will take on more of a rustic flavor as will dessert bar set ups. As with interior design, wedding decor will see an emphasis on wood and natural elements, rustic wooden ceremony arches, engraved wood invitations and wood table numbers will continue to be popular. In the mountains, we’ll see a bit of a departure from the large ballroom weddings, to weddings at more remote mountain lodges and cabins. Weekend wedding extravaganzas will become increasingly popular especially in the mountains with more activities planned for guests. Mountain Chic and rustic glam will become increasingly popular. Just because it’s rustic doesn’t mean it can’t be elegant and luxe! In the mountains we’ll see more unusual wedding ceremonies such dogsledding, whitewater rafting weddings, horseback weddings and heli-weddings. Photobooths will continue to be popular, especially with non-traditional setups and beautifully draped fabrics. Although wedding cakes are making a comeback (as opposed to cupcakes), edible favors, cookie bars and dessert bars will be in strong favor. Family style dinner service will continue to be increasingly popular. The trend of having a mountain destination wedding and eco-friendly honeymoons will continue. Morning weddings with brunch receptions will gain in popularity. Winter weddings will become increasingly popular. Grey-taupes, mocha browns, champagne, golds, oranges, and lots of different shades of green will prevail. Overall, couples are choosing elements for their wedding that work for them; for their personalities and lifestyles, even if that means foregoing some traditions. naturally chic rustic decor photo by Naturally Chic. What wedding trends do you like? Are you seeing any other trends? Contact Naturally Chic at 1.888.679.9056 or email hello@naturallychic.ca for more information on planning your 2011 Rocky Mountain Wedding. Tip # 19 – Consider your special need guests when choosing your ceremony location. In the Canadian Rocky Mountains you can be married virtually anywhere, even on the highest peak overlooking a glacial lake. However, if you have guests with special needs, you’ll want to take special care when choosing your ceremony location. Remote locations can be especially challenging for guests with mobility limitations. You may have to make some tough choices if getting married in a remote location is a priority for you. You could opt for a small intimate ceremony, and hire a videographer to capture the live ceremony, then later meet up with your guests. If that’s not an option, you’ll need to find a ceremony spot that is accessible to everyone. Fortunately, it’s quite easy to find beautiful ceremony spots in the Rocky Mountain areas of Banff, Canmore, Lake Louise and Jasper, that are easily accessible to almost everyone. Is it a long walk to the ceremony site? How far away is the parking lot? Is it an uphill (or downhill) climb? Is the path rocky, gravelly or uneven? Is there limited parking access? Are handicapped accessible washrooms available nearby? Even if you don’t consider the walk to your ceremony site long, some guests will, especially in hot or windy weather conditions. To someone with mobility issues, uneven terrain can be quite difficult to maneuver. Even small inclines or declines can be challenging. If you have several guests with mobility issues then you may want to choose a site that is easily accessible, level and preferably has a paved walkway. On-site ceremony locations are a great option. The Fairmont Jasper Park Lodge has beautiful lawn space with a great view of Mt. Edith Cavell, while the Fairmont Chateau Lake Louise’s terraces provide stunning views of the lake. Parks can also be a good option. Riverside Park in Canmore or Central Park in Banff are both charming sites with paved pathways. Other sites may not have paved pathways, but are still quite accessible for the mobility challenged with a little assistance or a willing arm to hold on to. Tunnel Mountain Reservoir in Banff is one such option. Although there is no pathway, it’s fairly flat and located only a short walk from the road. There are also numerous viewpoints and recreational areas throughout the region that are suitable for ceremonies and yet are still easily accessible by vehicle. If there’s some distance or difficult terrain to traverse between the parking area and the ceremony, then you may want to see if it’s possible to drive limited mobility guests closer to site. You could even inquire about the availability of a golf cart to transport these guests. The Fairmont Jasper Park Lodge’s staff are quite happy to assist in matters such as this. At the ceremony site, see if there’s reserved handicapped parking. If not, you may be able to post your own signs to help designate handicap parking for guests who require it. Just be sure to let your guests know in advance there’s limited space reserved for this purpose. If you’re considering hiring a bus or shuttle to transport guests to your ceremony site, be sure to check that they can accommodate your guests with special needs. If you have several guests with limited mobility you may even want to consider hiring a van with wheelchair accessibilty. Finally, make sure all your guests are well taken care of. Let your guests know to wear comfortable footwear if appropriate. Have plenty of water available for your guests in hot temperatures and umbrellas in case of inclement weather. Remember, mobility challenged guests aren’t able to quickly seek cover from the elements as easily as others. With a thoughtful approach and a little extra planning, all your guests can be present at your wedding ceremony. Feel free to contact Naturally Chic at 1.888.679.9056 or email us at info@naturallychic.ca if you have questions about ceremony locations in the Rocky Mountains suitable for guests with special needs. Tip #13 – Consider a hiring a wedding videographer for your mountain wedding. Your wedding is one of the most important days of your life. You’ve chosen the beautiful and scenic rocky mountains as your wedding backdrop and you’re marrying the love of your life; why not capture it all on video? You’ve probably hired a photographer and that’s fantastic, but you may also want to have a living record of your special day that you can watch again for years to come. It’s becoming increasingly popular for couples wanting to document their special day on video and this is especially true for mountain weddings. With couples coming to the Canadian Rockies from all over the world, it’s inevitable that some friends and family may not be able to make the trip. What better way to share your wedding with these important people in your life than a wedding video – it’s almost as good as being right there! Videos capture the emotions and events as they happen. Many couples getting married in the Rockies are planning adventure weddings. Whether that means a wedding on the ski slopes or a ceremony high on a rocky peak only accessible by helicopter, there’s nothing more precious than being able to share your intimate ceremony with your loved ones. So really, you don’t have to miss out on your dreams of having an adventure wedding and your grandparents, who may not be comfortable flying in a helicopter, still, can watch you get married. Most videographers in the rocky mountains are active and comfortable going just about anywhere with you to capture your day. Whether you are planning a small, intimate elopement or a church ceremony in the mountains, most videographers can accommodate your needs. Most offer a wide variety of services, whether it’s to capture your ceremony only, or to be there for the entire day and not miss a single, precious moment. So what can you expect to pay? Every company is a little different in their services and what they offer. You can find services starting at $500. for a small elopement ceremony and up to approximately $2500. for full packages. Keep in mind that services offered can vary greatly and it’s best to consult with a couple videographers to see what works best for you. How to choose a videographer? Videographers offer several different styles of video, from “fly on the wall”, reality type videos, to cinematic, straight-cut videos, to artistic, documentary style videos or anywhere in between. Many videographers will spend hours editing your video to offer you a beautiful, professional production. Videos can also be personalized or have all sorts of special effects added. Choose a videographer that fits your budget, that you’re comfortable with and that you communicate well with. Of course, it’s important you like their style too! Most videographers will have videos on their website that you can watch or you can view their portfolio to gain a better idea of their style. If you know of other wedding videographers that service the rocky mountains, feel free to post them in the comments section. Contact us Naturally Chic, at 1.888.679.9056 (Toll-free in North America) for all your wedding planning needs. Tip #11 – Plan for the wind if you are having an outdoor wedding ceremony in the Rockies. Anytime you are having an outdoor ceremony, it’s smart to consider the wind and take extra precautions. Many outdoor venues are affected by windy conditions, especially wedding ceremonies taking place on a rocky peak, at a lake or an open meadow. If you are having a tented reception, will your tent stand up to wind gusts? Whatever your situation, it’s wise to have an indoor back up plan if the winds get really strong. Even if you don’t particularly mind the wind, it’s important to consider your guests’ comfort. Not only will some guests be uncomfortable if it’s really windy, but it can be difficult to hear the ceremony. You may want to have a microphone placed at the altar and have speakers set up for your ceremony so no one will miss your vows. Of course, if you feel a microphone stand at the altar is unsightly, your officiant can always wear a small lanier microphone and head set. As far as attire, avoid light-weight fabrics like chiffons and silks in your dress and the bridesmaid dresses. Let your hairstylist know that you’ll be having an outdoor wedding and he or she can suggest styles that will look great, but stay in place. The men may even want to use a little extra hair product to keep stray hairs in place. You might even want to indicate to your guests in a printed wedding insert or on your wedding website, that your ceremony location tends to get windy and they should dress accordingly. Also, take into consideration your ceremony decor if the site is known to get breezy. Keep your ceremony decor simple and avoid tall floral arrangements that may be tipsy in windy conditions; instead opt for low arrangements with a wide base. Arrangements in heavy garden urns also work well. Consider weighting down table cloths and take particular care with your marriage licence! A paperweight or a pretty rock work nicely to hold down papers and other documents. One other consideration; avoid unity candles in favor of less risky rituals , such as a wine box/ love letters ceremony whenever you’re outdoors. An open flame in windy conditions (or whenever you are outdoors) is not a good idea! With a little extra planning, you’ll hardly notice the wind. Of course, if you’re planning a helicopter wedding on a mountain peak, you’ll just have to make your peace with the wind! 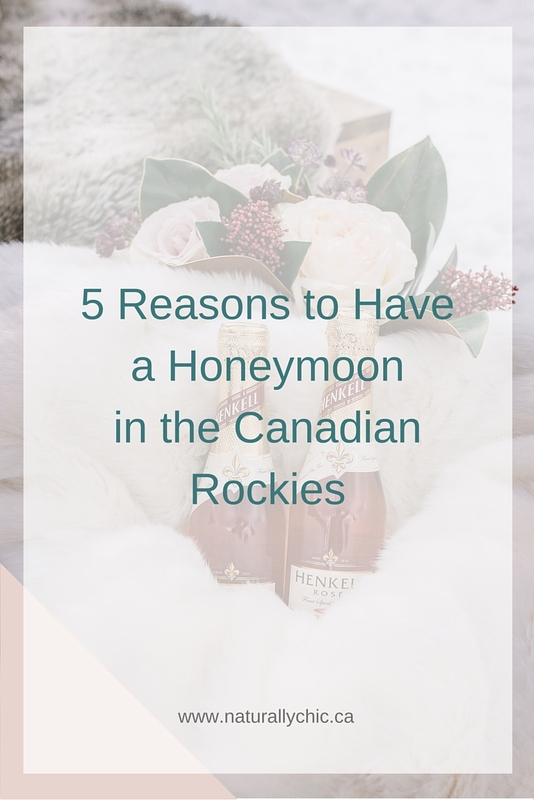 If you are wanting to plan a heli-wedding or a Rocky Mountain wedding, contact us, Naturally Chic at 1.888.679.9056 (toll free in North America) or email us at hello@naturallychic.ca. Naturally Chic specializes in eco-chic, outdoor, mountain and adventure weddings. 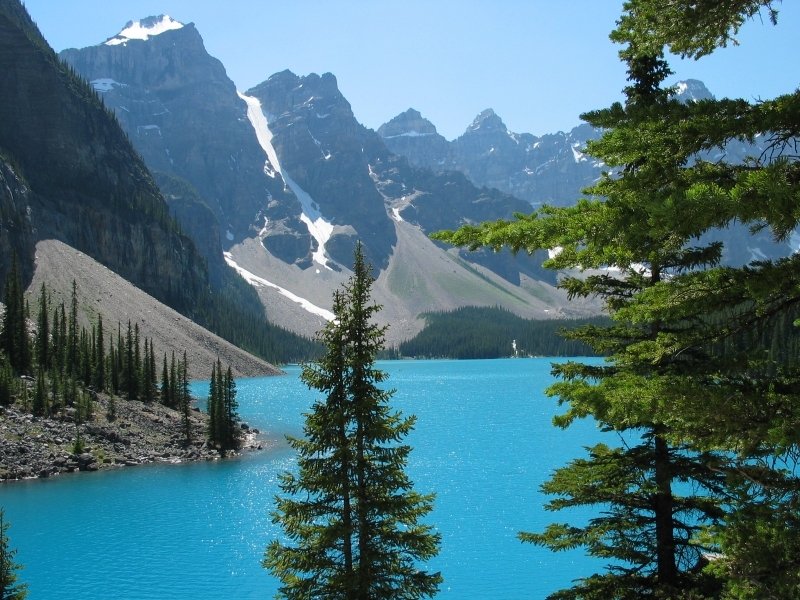 Tip #10 – The Canadian Rocky Mountains are a perfect destination not only for a wedding, but also for a honeymoon. It’s not always practical for couples to leave on an extended trip immediately following their wedding. It’s becoming increasingly popular for couples to forego the traditional honeymoon immediately following their wedding, and instead opt for once in a lifetime trips to exotic locales. With many couples financing a large part of their weddings, couples often wait a few months to get their affairs in order before honeymooning. This sometimes means using up your Christmas or summer holidays. It’s still important to have some kind of a honeymoon right after the wedding. Right? Let’s face it, weddings can be stressful and at the very least, tiresome. It’s important to spend some together time and celebrate the beginning of your new life together. A “mini-moon” in the mountains is a perfect way to spend quality time after the wedding! Romance in a beautiful mountain setting comes naturally. With incredible mountain views, consider a mini-honeymoon in Banff, Canmore, Lake Louise or Jasper. There’s so much to see and do in the mountains. Spending some alone time after the stress of planning a wedding, is a welcome experience for couples (especially if the “big honeymoon” is weeks or months away). The breathtaking scenery and romantic setting is a bonus for romance! There’s never a shortage of things to do and see in the Rockies. Not only is there world-class hotels, restaurants and spas, but there’s a lots of amazing activities to please every couple including; hiking, skiing, golfing, mountain biking, kayaking and more! A honeymoon in the Canadian Rockies doesn’t require a lot of extra planning or preparation. 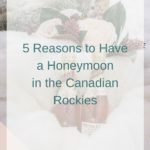 If you are already getting married in the mountains, a Canadian Rockies honeymoon won’t be a lot of extra work or planning. In other words, you can make a quick getaway! You don’t have to worry about currency exchange, passports, vaccinations or other travel related preparations. This is also true for couples who live close by in Alberta or BC. Most lodges, hotels and accommodations offer honeymoon packages. You can often find packages that include not only your accommodations, but a romantic dinner, champagne, sweets, and more. Every hotel is different, so be sure to ask what they offer. You can often grab great deals as part of packages! Of course, everyone is nicer to honeymooning couples too! In Banff, consider staying at the world renown Fairmont Banff Springs Hotel. It’s the ‘castle in the mountains’ and has incredible views of the Bow Valley. They offer a fabulous honeymoon package. Spend the day hiking or skiing in the mountains. Après ski, you can relax in an outdoor heated pool overlooking the mountains or soak in the soothing, spring mineral fed, Banff Upper Hot Springs. Later enjoy decadent dining at the AAA, five diamond restaurant, the Eden, at the Rimrock Resort. Culminate the evening with champagne and strawberries in your room. In Canmore, consider staying at the contemporary resort, the Grande Rockies Resort. Spend the day mountain biking on the many trails of the Canmore Nordic Centre. Later have lunch and a locally brewed beer at the Grizzly Paw. In the afternoon, consider a couple’s hot stone massage at the Bohdi Tree Spa. Finally, dine at the Habitat Restaurant and Bar. In Lake Louise, consider a day of skiing at the world famous Lake Louise Ski Area and Mountain Resort or ice skating at Lake Louise. Tour the impressive Fairmont Chateau Lake Louise and have lunch at one of eight venues on site. End the evening enjoying wine from one of the biggest wine cellars in the area at The Post Hotel. In Jasper, stay at the Jasper Park Lodge and enjoy many hikes and activites; including caneoing in the summer and ice skating in the winter. Visit the Lodge’s new spa and enjoy luxurious Rocky Mountain inspired spa treatments. Spend the evening cozying up to a roaring fire in your very own luxury cabin. These are just a sampling of the many, varied honeymoon experiences in the Canadian Rockies. If you are getting married in the Canadian Rockies, contact Naturally Chic for assistance at hello@naturallychic.ca. The town of Jasper is located in the heart of Jasper National Park, three and half hours west of Edmonton and approximately four hours from Calgary (if taking the scenic Icefields Parkway). Jasper National Park is the most northern of the four designated Rocky Mountain National Parks. As with the other Rocky Mountain National Parks, Jasper is as equally stunning and picturesque. The Town of Jasper is becoming increasingly popular as a wedding destination especially for outdoor enthusiasts who enjoy hiking, mountain biking, skiing, snowboarding, fishing, rafting and more! Another added bonus? Jasper is often less busy than its counterpart, Banff. There are so many great ceremony spots located in close vicinity to the Town of Jasper, that most ceremonies take place in the Park or at one of the many great mountain lodges. However, the Town of Jasper does rent out their large multi-purpose hall for weddings and events. Contact the Town of Jasper, if you are interested in this facility. You will be required to fill out an Facilities Booking Request Form; for more information call: 780-852-3381. There must be compliance with National Park regulations at all times. It is recommended that the maximum number of guests attending the ceremony not exceed 25 people. At no time does an event have exclusive rights to an area. The function must not displace regular visitors’ enjoyment of the park and its facilities. Day-use areas should only be used for the ceremony. Extended stays or receptions are not appropriate. Participants and guests require a valid National Parks Pass. The event must comply with the Gaming and Liquor Control Act of Alberta. No liquor is permitted in public areas. A thorough cleanup of the site immediately after the event must be done. Organizers accept full responsibility for any incidents, and/or costs of clean up or site rehabilitation resulting from the event. Nothing shall be thrown/scattered: no confetti, rice, flower petals, no butterflies or balloons released. Decorated cars are discouraged. Decorations blow off and litter our roadways. Day-use areas are closed after 2300 hrs. The person responsible for the event will attempt to keep vehicular traffic to a minimum. Car pooling or group transportation is preferable. No gas-powered generators are allowed. No excessive noise, horn honking, loud music or P.A. systems are permitted. Contact Naturally Chic at 1.888.679.9056 or info@naturallychic.ca to discuss your Jasper wedding. There’s no denying that marrying in the Town of Banff, Alberta or Canmore, Alberta will provide a stunning background for an outdoor ceremony. You can have a beautiful outdoor wedding ceremony in Banff or Canmore and then have your reception at one of the many world-class hotels in the areas. If you are contemplating getting married at one of the popular outdoor areas in either town, you should be aware that permits are required. There are several areas that are popular for outdoor wedding ceremonies in the Town of Banff; The Central Park Gazebo (Louis Trono Gazebo) and The Tunnel Mountain Reservoir (the Meadow) are very popular spots. There are special considerations associated with having a wedding within the national park boundaries (the Town of Banff is within Banff National Park). An application form must be filled out by all wedding organizers to ensure they are aware of these special conditions. It’s a short application and is for information purposes only. Because both Gazebo and the Meadow are popular areas for weddings, there is a fee associated with reserving these spots for your wedding. The fee in 2010 was $221. for a four hour time slot for either. Please remember that these fees are subject to change and the Town of Banff is expecting likely a 4 to 7% increase in prices for 2011 bookings. For more information on facility bookings in the Town of Banff contact: Town of Banff Community Services at 403.762.1251. In the town of Canmore, a couple of the most popular places to say your vows is at Quarry Lake or Riverside Park (although there are numerous places for suitable for smaller weddings). Riverside Park offers outstanding views of the Bow River, the Rundle Range, Ha Ling Peak and the Three Sisters. Quarry Lake is located along Spray Lakes Road on the south side of the Bow Valley it has spectacular views of Ha Ling Peak, Mount Lady MacDonald, and the Rundle Range. Quarry Lake is a more rustic setting than Riverside Park. Parks are not closed to the general public during rentals. A permit ensures that no other wedding or special event is booked in the park for the duration of the rental period. There may be 2 weddings in a day, but never at the same time. If you are wanting chairs, you will need to rent them as they are not provided (except in the case of Louis Trono Gazebo where approximately 70 chairs are available). Motorized vehicles are not allowed at Quarry Lake or the Meadows, so you will have to bring in chairs and other ceremony items manually. For more information on outdoor wedding ceremonies in Banff National Park, read this Naturally Chic post. If you have any questions on weddings in Canmore or Banff, please feel to give us a call Naturally Chic at 1.888.679.9056 or email us at hello@naturallychic.ca. 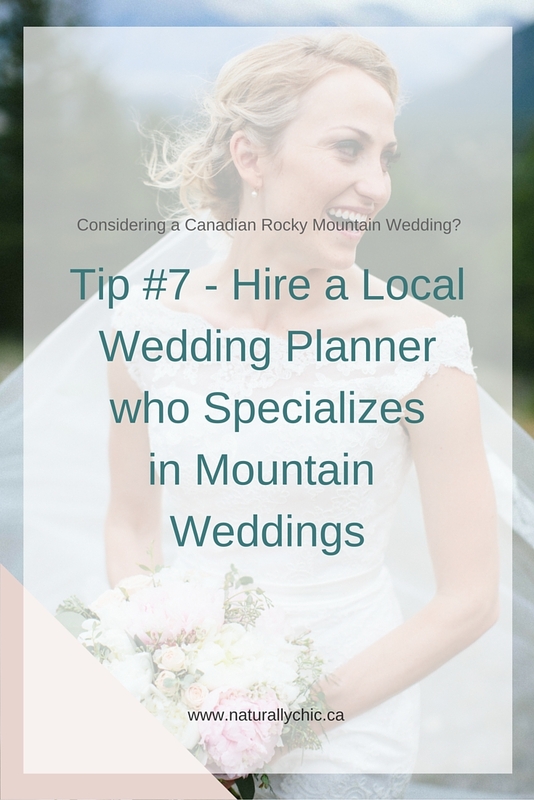 Read Tip #7 for Planning a Rocky Mountain Destination Wedding in Banff, Canmore, Lake Louise and Jasper here. Did You Know? Quarry Lake is reclaimed from an old mining area and is now one of Canmore’s many environmental success stories. You can swim in the lake July and August. The lake is fed by an underground mountain spring! We’re sharing tips for planning a Canadian Rocky Mountain Destination Wedding in Banff, Canmore, Lake Louise, and Jasper. Here’s Tip #7. Consider hiring a wedding coordinator / planner who specializes in mountain weddings in the area you are getting married at. A Canadian Rocky Mountain destination wedding is appealing in so many ways! With picturesque beauty, nothing is more beautiful or romantic than a magnificant mountain setting. Planning a wedding at anytime can be a daunting experience, but planning a destination wedding, even more so. From hiring wedding professionals long distance, to planning your decor, to traveling and packing everything to bring, challenging is an understatement! Even if you live relatively close, a mountain wedding still means travel and accommodations for you and your guests. Logistically, there’s just more things to take care of. You’ll need a clear game plan for everything to run smoothly. 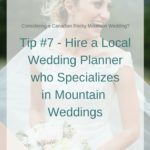 Hiring a local wedding planner who specializes in mountain weddings will save you much time and stress. Not only will they know which local wedding vendors are of the highest quality and offer the best value, they’ll also be able to give you the inside scoop on things to do in the area and great places to eat! They can assist you in finding a suitable reception venue and help you find a perfect ceremony location, even if that means a mountain meadow accessible only by helicopter. They’ll help you secure caterers, florists, photographers and other local vendors, and they’ll let you know what permits you require. An experienced planner will have contingency plans for mountain weather, whether it be wind, rain, heat or snow! They can advise you and your guests on what to wear for various conditions and they’ll likely come prepared with sunscreen, bugspray, umbrellas and whatever is necessary for your guests to be comfortable. Canadian Rocky Mountain Destination Weddings are our specialty! Contact us at Naturally Chic hello@naturallychic.ca or 1.888.679.9056. You can read about Tip #6 here. 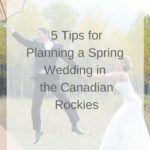 Welcome to our series on 30 Tips for Planning a Rocky Mountain Destination Wedding in Banff, Canmore, Lake Louise, Jasper and Beyond! Tip #6 – If you are planning a wedding anywhere in a Canadian National Park then you and your guests will require a Park Pass. What can you expect to pay? Here are the current prices as listed on the National Parks of Canada site (please note prices are subject to change and it is suggested that you check in April every year for current pricing): Entry – Day Adult Individual Day – $9.80 Senior Individual Day – $8.30 Youth Individual Day – $4.90 Family/Group Day – $19.60 Annual – Discovery Pass* Adult – $67.70 Senior – $57.90 Youth – $33.30 Family/Group – $136.40 It’s a good idea to let your guests know about park passes in advance, that way if they are planning on staying longer in the area (or visiting other National Parks) they may want to consider getting an annual pass rather than a day pass. Note: Canmore, Alberta is just outside the Banff National Park boundary and therefore a park pass is not required if you are planning on marrying in Canmore. 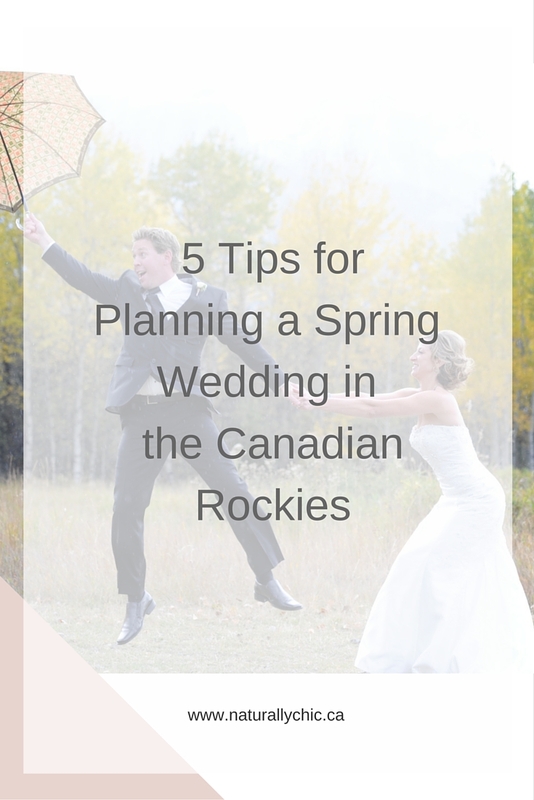 You can read about Tip# 5 for Planning A Rocky Mountain Destination Wedding in Banff, Canmore, Lake Louise and Jasper here. Photo Courtesy of Emerald Lake Lodge.